Hi there! It’s Jess and Jim, fellow preschool parents . . .
Now I have to tell them my son has cerebral palsy and explain why he uses a walker. By now, you’ve probably noticed that there’s one spunky, silly 3 1/2-year-old who doesn’t quite match the rest. But wait, that’s putting Graham’s differences before Graham, isn’t it? Can’t I start the email by showing how normal he is? This morning, our son Graham threw himself onto the ground, kicking and screaming, because I didn’t use my maternal ESP to divine exactly which way he wanted me to design his breakfast plate, and the pomegranate seeds were totally in the wrong spot. Ugh. Now he’s also a brat. This might be the hardest thing I’ve ever written. It’s an email to the parents of all the kids in my son’s new preschool classroom, detailing what’s special about our child and why, and laying out some tender ground rules for their kids to learn—no pushing his walker down the stairs, etc. I’ve had it started for a good week or two, but procrastination has gripped me hard. Everything feels hard all of the sudden, for some reason. It’s hard to get myself and my kid and my stuff into the car, hard to make coffee, hard to motivate. It must be the rain. Yes, that’s it. I’m suffering from shock after Seattle’s 85-day streak of gorgeous weather has (quite spectacularly) ended. Months ago, I agreed to be part of The Oxbow Box Project, an effort on the part of Oxbow Farm to get the word out about their CSA box. 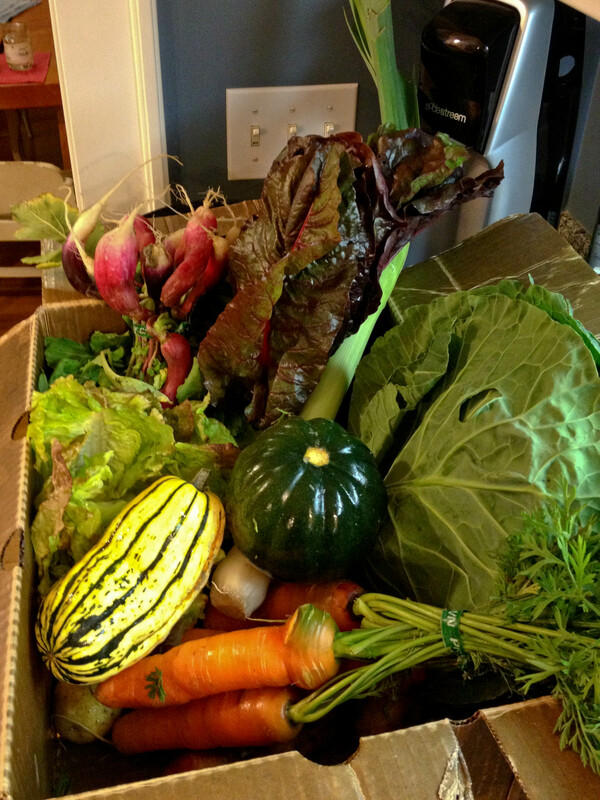 In theory, it’s easy: They give me one of their weekly CSA boxes, brimming with produce, and I see what happens with it in my kitchen. Only, my pick-up day was the first day of The Rain. Stars crossed. The parking gods frowned. I dragged a cantankerous child to the pick-up, and the contents of that boisterously-colored box went into the fridge without a smidgen of ceremony. The next day, I painted mascara over my bad humor, got on an airplane, and flew to New York, hoping the vegetables would remember me when I returned. Here’s the good thing about fall vegetables: They’re very patient, and they don’t hold a grudge. They don’t mind if you skip the warm reception, or if you go out of town. When I got back, the squash was still firm, and the collards and chard were still bright and perky. I sliced long radishes for a snack, and twirled pasta up with softened leeks, bacon, and shaved radicchio. This morning, I had roasted yellow beets for breakfast, like it was the most normal thing in the world. Or roast them soon, on a rainy night, when things feel hard but you know they really aren’t. (Tell me I’m not the only one who gets all dramatic when it rains.) You can float the back of your hand over your forehead and pretend you slaved over them. You can make up something complicated about what you did to get them to caramelize, dark and sweet, on each cut side. But you’ll know, deep down, that they’re just roasted carrots with mascara on–carrots with a mustardy little kick in the pants that elevates them from random root vegetable to elegant success story. It’s just what we all need sometimes, isn’t it? Nash’s Organic Produce in Sequim is known for its sweet, crunchy Nantes carrots, which grow particularly well in cool climates and the alluvian soil that covers the northeastern portion of the Olympic Peninsula that Nash’s calls home. Roasted, they become even sweeter. You can cut the tops off the carrots entirely, if you’d like, but I prefer to leave about ¾ inch untrimmed — I like how the little green sprouts look, and they’re perfectly edible. 2. Mix the carrots, oil, mustard, and salt and pepper to taste together in a casserole dish large enough to hold the carrots in a single layer. Turn the carrots cut sides down, and roast for 25 to 30 minutes, until tender. 3. 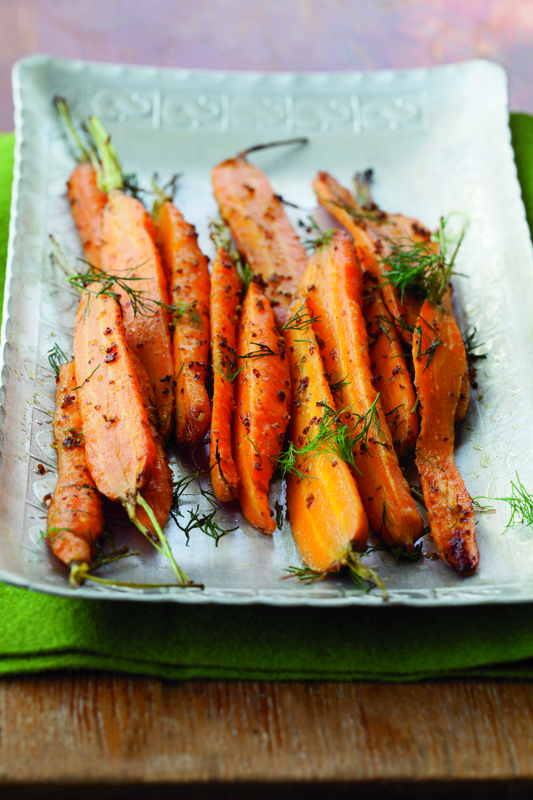 Sprinkle the dill on top, pile the carrots into a serving dish, and serve immediately.